Look (again…) in Marcella Hazan’s Classic Italian Cookbook. The text looks like she has been sponsored by the garlic and parsley industry. No wonder. Chopped garlic and chopped parsley is good in almost anything. Labskaus belongs to my childhood food. As I learned to know it, it was a mishmash of potatoes, red beets and some other fillings a child is unable to analyze, and it came with a pickle wedge (or is it wedge of pickle), a pickled herring of one or another sort and a fried egg. This is, more or less, how my mom makes labskaus. She’ll chime in and protest, I’m sure: labskaus is, in fact, not a recipe: it is once through the pantry and back. Of course, we’re talking a ship’s pantry. My thoughts keep returning to Daffy Duck and the line, halfway into the cartoon “Duck Amuck”: “Thea picture, eh? I alwayth wanted to do a thea epic,” (I did supply a YouTube link, but it died). So, yes, when I looked on the web for orrriginal labskaus recipes, fantasies of twenty hungry sailors, of a stiff breeze and of shrieks of greedy gulls started forming in my mind. Here’s a list of ingredients with which someone’s father used to cook true navy-style labskaus forty years ago: 5 kilogram (11 lbs) of salted pork, same amont of salted beef. 8 kg (17 1/2 lbs) potatoes, the non-fluffy kind. 2 1/2 kg (5 1/2 lbs) onions. 1 1/4 kg (2 3/4 lbs) butter. Pickled herring and eggs to serve. The author of this writes that those recipes that add red beets to the mash are Not Authentick; the red color of labskaus comes from the salted meat. I have an issue with red beets: they upset my stomach and give me a headache. One day shortly after a lunch with warm beets, a neighbor’s kid split my head open with a huge enameled green pan that functioned as a toy in his sandbox (I was about five years old). I saw too much red on that day. A good reason to test the sea picture mash. Since there are no twenty hungry sailors here who have been scraping rust or done whatever else sailors do in the cold for a whole morning I scaled the total amount down a bit, as can be seen on the pictures. 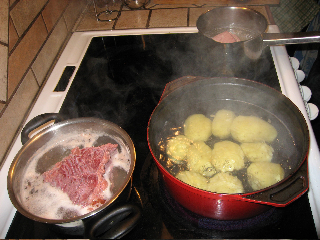 The meats are boiled in separate pans, “until firm to the bite” (I wonder what they were before boiling, but okay…), as well as the potatoes.